My Artistic Teenagers...they come by it naturally! I remember when my kids were little I really wanted them to WANT to draw, color, play with clay and just want to be crafty WITH me. It took my son a lot longer to catch the "craftying fever" but my daughter was always drawing, coloring, crafting, knitting...just being overall creative. But now I complain about all their crafty pursuits...but not too much. In fact, this month my kids both participated in the Legacy Jr. High Annual Art Show. My daughter who is in 8th grade created this painting with acrylics of her most favorite topic, sharks! My son who is in 9th grade also participated in the art show. He was even fine with me taking a photo of him at the even (not normal). He did this pencil sketch of a World War II air assault. Not only did most of his peers vote this among their favorite, but it also made it on the flyer they created to advertise the Legacy Jr. High Art Show. We wanted to wish you a very Merry Christmas! We are so thankful for the friends and family that have touched our lives this past year for the good. Thank you for your kindness, love and support. We are blessed to remember our dear Saviour that we celebrate his birth tomorrow. And let's face it, we're just plain thankful for a few days off of work!! Oh and I still have a few Christmas cards sitting here awaiting some postage...you'll get them, but they will be late. This is the photo we enclosed in our cards this year. 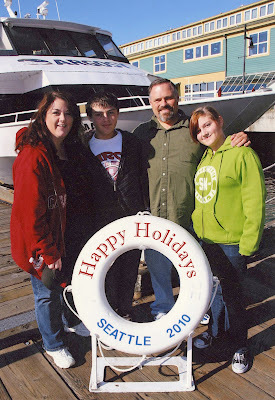 It was taken on our trip to Seattle to visit Kirk's little sister and her awesome family. It's not the best picture, but it was one of our favorite memories from this past year! 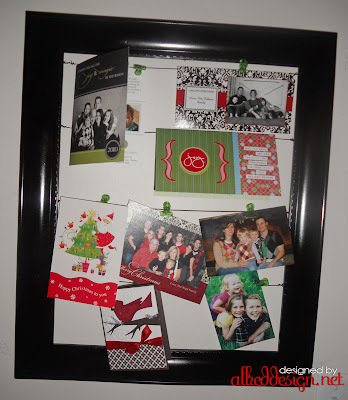 I got this idea when I stopped by Teresa Collins home one day and she was showing me her Countdown to Christmas Tag holder that she would featuring when she introduced her 25 Days Countdown on her blog. Anyway, her friend Lara said she picked up the frame super cheap at Taipan, painted it black, attached eye hooks and ran wire back and forth through it. I LOVED it and couldn't wait to make one for myself. Every holiday season I end up hanging all my cards and photos I receive on the "wall" of all places and I don't really like it there. So I knew I would be whipping up my very own simple frame holiday card holder super quick before all my cards started arriving. I've been doing a little blog hopping and came across some darling ideas worthy of sharing with you. Especially if you're still trying to come up with those last minute gifts or decoration ideas. These simple and inexpensive Christmas gift and decor ideas are among my favorites I've come across recently. 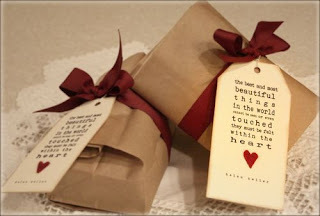 First, I loved this darling idea over on Stephanie Ackerman's blog and she's so sweet you can even download a PDF of the tag. But how cute are these simple lunch sacks filled with cookies or whatever you want. I tell you, ribbon totally makes a gift!! . Shanty2Chic is a new blog I stumbled across and I LOVE it...they offer up all types of crafty inspiration for bargain prices. This darling photo holder looks like the ones I've seen at those darling boutiques for $20-25, but when you check out how they made it you'll be shocked how inexpensive an idea this is. 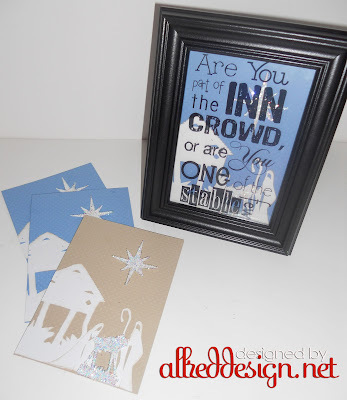 About a month ago I was asked to create a fun Cottage Christmas kit for the Northridge Publishing fans. Then with the help of the talented Kristine McKay I shot a video showing off what was included in the kit and the projects you'll get when you purchase the kit. I'm excited to do more project like this in the near future for Northridge and some other fan favorites!! I'll keep you posted. You can read more about the kit on Northridge's blog. Now as many of you know I did a segment on Neighbor Gifts featuring Imaginisce's Cottage Christmas collection last week. I wanted to share some back stage photos and a video of the segment for those of you that missed it (like my mom). Be sure to scroll down to find out the winners from last week!! This has been one of my favorites over the years and couldn't resist sharing these with everyone. It's super simple and only requires those large candy bars, like a Hershey's bar or Symphony bar. Wrap it with some Cottage Christmas paper and print out the poem (download your copy below). Download a copy of this poem to reprint for your neighbor gifts.